I know, I know, only a Sith deals in absolutes. Anyway, this is an obligatory end of the year post that’s a day late, because I never finish anything I start on time. This kind of stuff usually works best with bigger lists. Especially since I have such a hard time picking a best of/worst of anything. But I’m going to force myself to pick a best and worst, and a biggest surprise for each of the main media type things I consume regularly. For anyone just tuning in to my rants, that’s books, movies, video games, TV and toys. I like to leave music alone, because I just hate so goddamn much of it, and there really isn’t any good reason for it. But that’s another rant. So… here we go with 2012 In Absolutes*. *please keep in mind that I haven’t seen, played or read many things that were released this year. In regards to books, I haven’t read hardly anything at all that was released this year, so I’ll be dealing instead with the ones that I did indeed read, many of which were only really popularized this year because of movie tie-ins. The Walking Dead is everywhere these days. Over 100 issues of the comic have been released in the last 9+ years. AMC is in the middle of the third season of their TV adaptation. There’s social media games, pen and paper games, and board games. Now indie-dev-darlings Telltale Games attempt at submerging us into the world of Robert Kirkman’s zombie apocalypse comic book series. 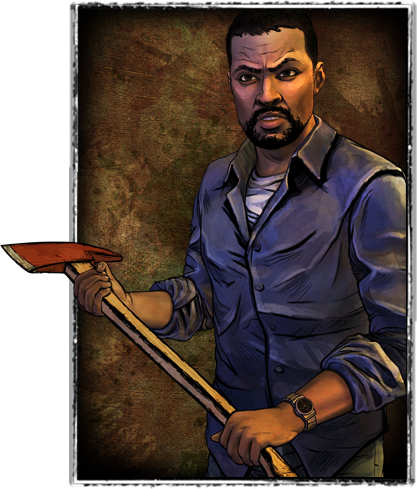 You play out the story of Lee Everett. When the zombie apocalypse finds him, he’s in the midst of being transferred from jail to prison to serve his time for a murder with extenuating circumstances. However, when there’s no more room in hell, the dead will walk in front of police transit vehicles. The folks at Telltale have made a name for themselves among PC and Indie game enthusiasts in the last few years. They’ve managed to tap into a market long forgotten: The fan of the point-and-click adventure. They’ve made critically acclaimed (and financially successful) games out of surprising movie, video game, comic and TV licences, including Jurassic Park, Back to the Future, Sam & Max, and Monkey Island. These games are released episodically, over the course of a few months to a year. This was my first venture into one of their games. If the quality here is any indication, I’ll be trying at least 3 of those other games as soon as I take another run through The Walking Dead.